A pot culture experiment was conducted to study the effect of various concentrations of cerium provided as cerium nitrate (0.713, 3.568, 17.841, 89.206 and 446.030 μM) on the growth performance, dry matter production, biochemical constituents and enzymatic activity of cowpea plants [Vigna unguiculata (L.) Walp.]. Low concentrations of cerium were observed to be beneficial for the test plants. A positive correlation was observed between a lower level of cerium (0.713-17.841 μM) and foliar chlorophyll content, relative yield (dry matter) and nitrate reductase activity. 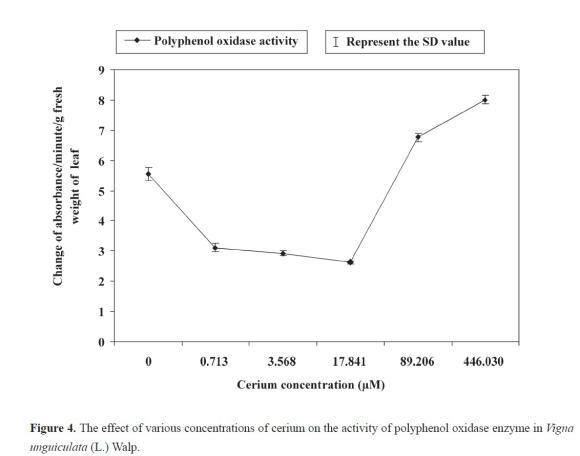 Higher levels of cerium (89.206-446.030 μM) significantly increased the proline content and polyphenol oxidase activity of the test plants. Root growth was more adversely affected than shoot growth. Keywords: Cerium; enzymatic activity; foliar chlorophyll content; free proline content; Vigna unguiculata (L.) Walp. Abbreviations: NR, Nitrate reductase; NiR, Nitrite reductase; PPO, Polyphenol oxidase; REEs, Rare earth elements; ROS, Reactive oxygen species. Of the 92 elements present in the earth's crust, only 17 elements are known to be essential to all plants, and 12 elements have been proven to be potentially beneficial in trace amounts. These include Silver (Ag), Cerium (Ce), Chromium (Cr), Fluoride (F), Iodine (I), Lanthanum (La), Rubidium (Rb), Tin (Sn), Strontium (Sr), Titanium (Ti), Vanadium (V) and Tungsten (W) (Pilon-Smits et al., 2009). Lanthanum and cerium belong to the group of light rare earth elements (REEs) because their atomic mass is lower than 153 amu. These elements are fairly abundant in nature and beneficial for plant growth (Yin et al., 2009). Chloride and the nitrate forms of lanthanum and cerium are the main constituents of commercial REEs micro-fertilisers, and they have been widely used in China since the 1970s as REEs micro-fertilisers to improve crop plant growth and yield (Hu et al., 2004). There are conflicting results regarding the effects of REEs on plant growth and development, most likely due to the effects of factors such as soil pH, soil chelates and the available level of fertilisers. He and Loh (2000) reported that cerium provided as cerium nitrate (0.5-10 μmol L-1) in a culture medium significantly enhanced the primary root growth of Arabidopsis thaliana. However, REEs as (REE)xOy decreased root length in rice plants (Hu and Ye, 1996). REEs enhanced the speed of seed germination and growth (shoot-root length) of agricultural crops such as rice, wheat, barley and vegetable crops (Guo et al., 1988; Ni, 1995; Shyam and Aery, 2011). A general requirement by crop plants for lanthanum and cerium has not yet been established. With these facts in mind, cerium as cerium nitrate was applied to cowpea plants [Vigna unguiculata (L.) Walp. ], an important leguminous agricultural crop grown in silty sand, to evaluate the effect of cerium on plant growth, dry matter production, biochemical constituents and enzymatic activities. 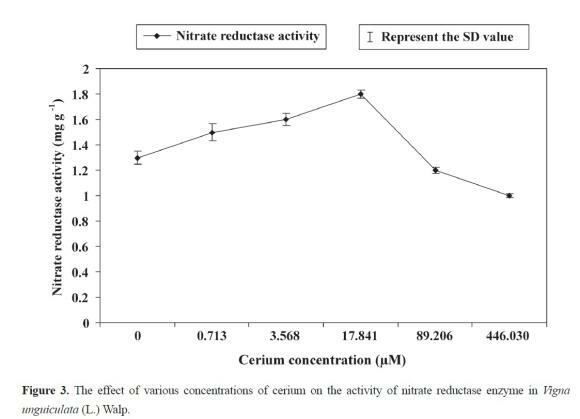 Cerium as cerium nitrate [Ce(NO3)3.6H2O] was applied at doses of 0.713, 3.568, 17.841, 89.206 and 446.030 μM. The different concentrations of cerium were prepared separately by taking corresponding amounts (calculated based on molecular weight) of the chemical/kg of air-dried soil. Pots without added cerium constituted the control. Three kilograms of soil were filled into earthen pots of 30 cm height and 25 cm diameter. The soil used was silty sand. The experiments were set up during the month of July under natural conditions. The maximum and minimum temperatures during the study period were 31.1Â° C and 24.5Â° C, respectively, and the photoperiod was 12 hrs. Fifteen certified seeds of Vigna unguiculata (L.) Walp. Var. Sephali Sikha-313 were sown equidistantly at a 2-cm depth in each replicate. Watering was performed on alternate days, with 200 ml of water added to each pot. After establishment, the seedlings were thinned to 10 in each replicate. The sets were prepared in triplicate to record observations during the life stage. The standard procedures suggested by Fisher (1950) were employed by applying the analysis of variance ratio (F) technique for "Complete Randomised Block Design" to test the significance of the experimental results (Table 1 and 2). In most cases, the F values were found to be highly significant. Critical differences (CD) for the treatment means were calculated at a 5% and 1% level of significance. Table 1 and 2 summarises the effects, along with the LSD Â± and CD and their analysis of variance (ANOVA), and the correlation coefficient (r) and regression equations (y) were calculated as described by Panse and Sukhatme (1995). After flowering, the cowpea plants were harvested and washed with double distilled water, and the shoot-root length was measured. The plant samples were dried at 80Â° C for 48 hours in an oven and weighed to obtain the dry weight of the shoot and roots. The foliar Chl. 'a', Chl. 'b' and total chlorophyll were determined using the Arnon method (1949). The free proline contents of the cowpea leaves were determined according to Bates et al. (1973) using the ninhydrin method. The fresh cowpea leaves (0.5 g) were hand-homogenised in 10 ml of 3% (w/v) sulfo-salicylic acid. The homogenate was filtered through Whatman No. 2 filter paper. In another test tube, 2 ml of acid ninhydrin and 2 ml of glacial acetic acid were added to 2 ml of the filtrated extract. The resulting mixture was incubated at 100Â° C in a hot water bath. The reaction was then stopped using an ice bath, and the contents were extracted with 4 ml of toluene and mixed vigorously using a test tube stirrer for 15-20 seconds. The chromophore containing toluene was aspirated from the aqueous phase and thawed to room temperature, and the absorbance of the solution was measured at 520 nm using a UV-visible spectrophotometer (PHARMASPEC UV 1700, SHIMADZU). A mixture without the leaf sample was used as the blank. The proline concentration was determined from a standard curve prepared with L-proline. The results are expressed (free proline content) as umoles of proline g-1 of fresh weight. The polyphenol oxidase activity was measured according to the method described in Mahadevan and Sridhar (1982). Fresh leaf samples (0.05 g) were homogenised in 0.1 M phosphate buffer (10 ml), pH 6.0, and the homo-genate was centrifuged for 30 minutes at 2000 g at 4Â° C. The supernatant was used as the enzyme source. The enzyme activity in each extract was assayed in triplicate. Three ml of catechol (0.1 M) were placed in a clean, dry cuvette that was transferred to a UV-visible spectrophotometer (PHARMASPEC UV 1700, SHIMADZU). To start the reaction, 0.1 ml of supernatant was added to the cuvette. The initial ab-sorbance and the subsequent changes in absorbance after each 30-second interval for 3 minutes at 495 nm were noted. A blank without supernatant was run simultaneously. The PPO activity was expressed as the change in absorbance/min/g fresh weight of leaf. 2.6.Â Estimation of Nitrate reductase (NR) activity The NR activity was assayed according to Malik and Singh (1980). Fresh cowpea leaves (0.2 g) were cut into slices. The chopped plant leaves were suspended in 5 ml of assay mixture. The assay mixture contained 4 ml of 0.1 M phosphate buffer (pH 7.0), 0.5 ml of 0.1 M KNO3 and 0.5 ml of 5% n-propanol. After capping, the test tube containing the assay mixture and plant tissue was incubated in the dark at 30Â° C for one hour in a cooling incubator (REMI-CI-10S). A blank without the leaf sample was also run simultaneously. After incubation, a 0.4-ml aliquot of the reaction mixture was removed and transferred into another test tube containing 1 ml of 1% sulphanilamide (prepared in 1 N HCl) followed by 1 ml of 0.02% NEDH (2-Napthylene diamine hydrochloride). After 20 minutes, 4 ml of distilled water was added to each test tube. After 10 minutes, the asorbance was measured at 540 nm using a UV-visible spectrophotometer (PHARMASPEC UV 1700, SHI- MADZU). Cerium showed a positive effect on the shoot-root growth and relative yield (dry matter) and affected the biochemical constituents and enzymatic activity of the cowpeas [Vigna unguiculata (L.) Walp.]. The maximum enhancement in the foliar chlorophyll (Chl. 'a', Chl. 'b', Total Chl.) contents was observed at the 17.841 μM concentration of cerium (Table 1 and Figure 1). The increase in chlorophyll 'a' (Chl. 'a'), chlorophyll 'b', (Chl. 'b') and total chlorophyll over the controls were 188.68%, 212.59% and 145.57%, respectively. In soybean seedlings, cerium provided as cerium chloride (20 mg/L) enhanced the rate of photosynthesis and the chlorophyll content in aquaculture experiments (Li et al., 2007). An increase in the chlorophyll a and b contents were observed in wheat leaves after the plants were treated with individual rare earth elements and a mixture of light rare earths (Jie et al., 1985). An increase in the absorption of nitrogen and phosphorus, an induction in the synthesis of a pre-compound of chlorophyll formation and an enhancement in the chlorophyll contents of spinach have been observed (Liao et al., 1994). Perhaps REEs play an indirect role in chlorophyll formation because some REEs are catalysts or because Ce3+ could enter into the chloroplast and bind easily to chlorophyll, replacing Mg2+ and form Ce- chlorophyll (Hong et al., 2002). In Mg2+-deficient Hoagland media, cerium chloride increased the synthesis of organic nitrogen, protein and chlorophyll in spinach plants. An 84.31% increase in the chlorophyll content over the control was observed at a 15 μM Ce3+ level (Yin et al., 2009) in spinach plants. 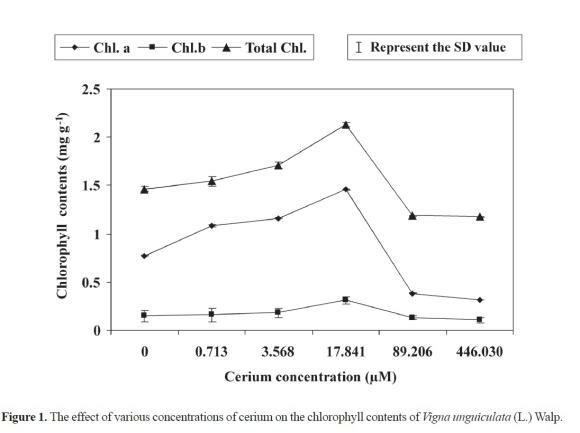 Higher concentrations of Ce (89.206 and 446.030 μM) resulted in a decrease in the chlorophyll (Chl. 'a', Chl. 'b', Total Chl.) contents over the control. Wang et al. (2007) have also observed that La and Ce reduce chlorophyll content in Hydrilla verticillata. The reduction in chlorophyll content (Table 1 and Figure 1) may be due to the formation of chlorophyllase, which is responsible for chlorophyll degradation (Mali and Aery, 2009), damage to the photosynthetic apparatus and disturbance of chlorophyll biosynthesis or its degradation caused by lipid peroxidation (Somashekaraiah, 1992). Proline (Pyrrolidin-2-carboxylic acid) is a five-carbon amino acid that is known to accumulate in plant tissues in response to salt, water and heavy-metal stress. The accumulation of proline by plants is an adaptive mechanism. Proline accumulation helps plants tolerate stress as the proline accumulates in the cytoplasm (Ketchum et al., 1991) where it functions as an osmotic buffer and an ROS-scavenger in addition to its function as osmo-protectant and membrane stabiliser. Lehoczky et al. (2000) proposed that proline also acts as a source of carbon and nitrogen for rapid recovery from the stress. The maximum proline contents were observed at the 446.030 μM level of cerium and were 25.37% higher than the control (Table 1 and Figure 2). The minimum proline content was observed at the 2.5 μg g-1 concentration of cerium and was 26.83% lower than the control. An increased proline content at the higher cerium concentrations (89.206-446.030 μM) might contribute to the involvement of proline in scavenging reactive oxygen species (ROS). This increase was significant at the 5% and the 1% level of significance. Li Guotai (2010) studied the effect of cerium on the chilling resistance of cucumber seedlings and showed that under chilling stress conditions, cerium increased the chlorophyll content and proline level in cucumbers. Toxic levels of La and Ce (30-100 μM) increased the free proline level of Hydrilla verticillata (Wang et al., 2007). REEs are also supposed to be involved in increasing the water use efficiency of plants by increasing their proline content. Proline has a strong ability for hydration. This indicates that an increased amount of proline may help plants to conserve water during drought periods ( El-Ramady, 2008). NR is the key enzyme in nitrate metabolism and is important in providing the organic nitrogen that is essential for plant growth. The maximum increase (38.46%) in the activity of NR over the control was observed at the 17.841 μM concentration of cerium, and this increase was significant at the 5% and 1% level of significance. 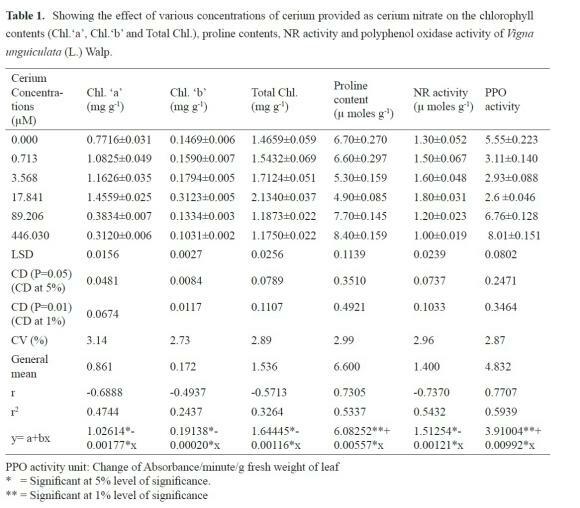 The minimum NR activity was observed at the 446.030 μM level of cerium, which was 23.07% lower than the control (Table 1 and Figure 3). NR catalyses the reduction of nitrate to nitrite during the assimilation of nitrate by the plant cell. Nitrogenase converts nitrogen gas to ammonia in a nitrogen-fixing microorganism. The reduction of nitrate to ammonium proceeds by the sequential action of the NR and NiR (Guerrero et al., 1984). NR, a molybdoflavo-protein, has Mo as a cofactor required for the transfer of electrons from NADH2 to nitrate. The source of the reductant is either the mitochondrial electron transport in the dark or the photosynthetically produced reductant in the light (Beevers and Hageman, 1969). Nitrate reductase is very sensitive to heavy metals because they have an affinity for sulfhydryl groups. The inhibition of NR activity at higher concentrations (89.206-446.030 μM) of Ce3+ might be due to interference with the NR structure, either due to the replacement of Mo or by weak binding with the -SH groups, which often determine the secondary and tertiary structure of proteins (Awasthi, 2005). PPO is essentially a Cu-dependent enzyme (Del Rio, 1983) and is involved in the oxidation of phenolic compounds as well as in the biosynthesis of lignins. The oxidation of phenolic compounds led to the production of quinones. Quinones are responsible for the reduction of toxic oxygen species and are considered to be more toxic than the phenols from which they are derived (Pillinger et al., 1994). In the present study, the PPO-activity was found to be at a minimum at the 17.841 μM concentration of cerium and was 52.61% lower than the control, and the maximum increase (44.32% higher than the control) in PPO activity was observed at the 446.030 μM level of cerium (Table 1 and Figure 4). An enhancement in the enzymatic activity was also observed at the 89.206 μM level of cerium, which was 21.80% higher than the control. It is possible that the mechanism for increasing PPO activity occurs in a 'latent form' in plants. The increased activity of PPO in the plant tissue after metal stress could have resulted from the activation of 'latent phenolase' or from 'solubilising' phenolase from the cellular structure as reported by Robby et al. (1964) for diseased plants under pathogen stress or due to de novo synthesis of polyphenol oxidase under metal stress (Michalak, 2006). In a solution culture study, cerium as cerium nitrate (0.5 μg g-1) significantly increased the shoot-root growth (14.99% and 47.44%) and relative yield (153.75% and 266%) of wheat seedlings (Shyam and Aery, 2011). 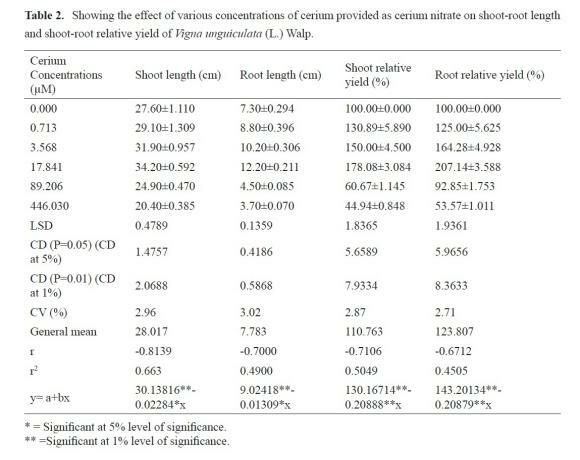 The results of the present study indicate that certain low concentrations (0.713-17.841 μM) enhanced the growth (shoot-root length) and relative yield of cowpeas (Table 2 and Figure 5&6). 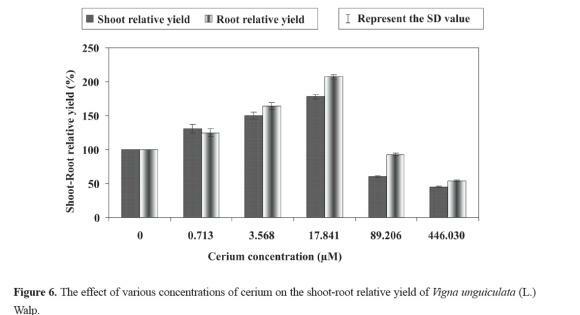 The maximum enhancement in shoot-root length and relative yield was observed at the 17.841 μM concentration of cerium, which was 23.91%, 67.53% for shoot and root length and 178.08%, 207.14% for shoot and root relative yield, respectively, over the control. Beyond this concentration, a gradual decrease in the shoot-root length and relative yield was observed. Retardation in growth was observed at higher concentrations of cerium (89.206 and 446.030 μM). 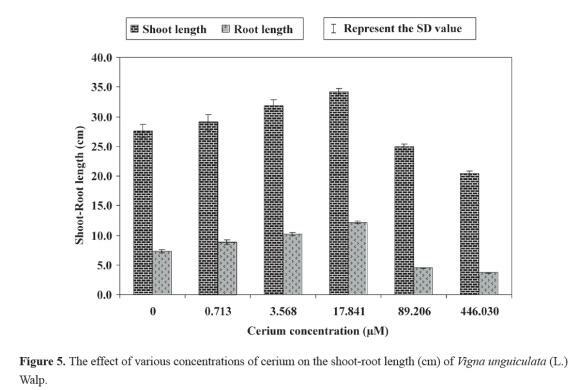 The maximum decrease in shoot-root length and relative yield (26.08%, 49.31% for shoot and root length; 44.94%,53.57% for shoot and root relative yield, respectively, over the control) was observed at the 446.030 μM dose of cerium. At the 446.030 μM cerium level, the root growth was drastically affected, and this concentration was proved to be highly toxic for cowpea plants. Diatloff et al. (1999) also found that 0.03-0.7 mg/l La or Ce reduced growth and the uptake rate of all nutrients for mungbeans and that 0.7 mg/l La or Ce had little effect on growth but reduced the uptake of Ca for corn. Growth inhibition caused by cerium can be attributed to the loss of cellular turgor (Gabbrielli et al., 1990) or to a reduced extensibility of the cell wall (Pandolfini et al., 1992; Aery and Jagetiya 1997; Mali and Aery, 2009), or it might be due to a decreasing efficiency of certain enzymes involved in food and energy utilisation. d' Aquino et al. (2009) has attributed the reduction in root growth after the treatment of REEs to a decrease in cell division. Cerium is not essential for crop plants, but the present study indicates that low levels of cerium enhance the shoot-root growth and relative yield (dry matter production), and cerium is beneficial for cowpea plants. Higher levels of cerium decrease plant growth and relative yield. 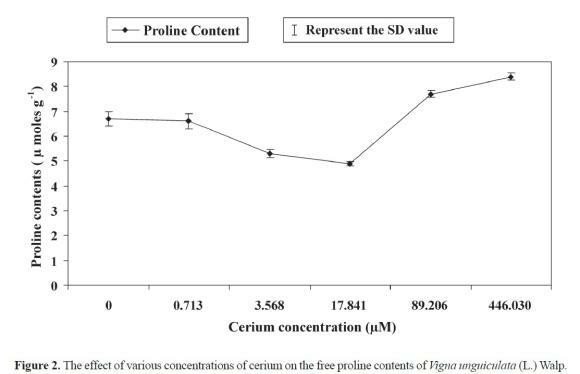 Applied cerium concentrations showed a significant positive correlation with the proline content and polyphenol oxidase activity and a negative correlation with the foliar chlorophyll content, nitrate reductase activity, shoot-root length and relative yield. The probable role of cerium as a substitute for Mg2+ in chlorophyll synthesis is indicated. The authors are thankful to UGC, New Delhi, for providing financial assistance in the form of a meritorious fellowship to Radhe Shyam.